Can I get an "amen?" Please? Someone? Anyone? What follows is mostly written from memory. While I can assure you that this accounting of our seeing Robert Tilton in person is true, the quotes are accurate or as accurately paraphrased as I could remember them. There was also a redundancy factor that caused me to leave a few things out that once said, had no further bearing on the story. Plus, I made up some names. We are on Robert Tilton’s mailing list. Well, Michelle is, anyhow. She is a fan of Tilton’s going back a-ways for reasons of entertainment and kitsch on a scale that might embarrass even the most cynical evangelists who make no secret of targeting your wallet, or if possible, all of your monetary assets because, you know, God needs your cash. As evangelists go, Tilton delivers. God and Robert Tilton are tight. Robert Tilton has had an up-and-down career as have many of the evangelists of his kind. Mostly up. But he has been touched by scandal more than once. He has overcome adversity and is once again working his way to, I dunno, apostolistic health and serious prosperity? But I’m not going to write about that. His history is easy to find. Just follow the links. No. 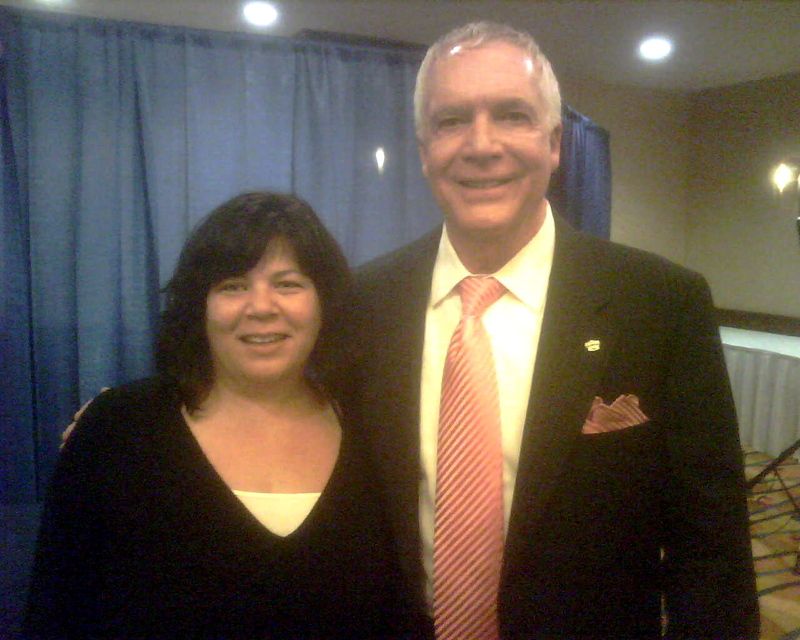 This story is about our visit to Robert Tilton’s Signs and Wonders Miracles of Faith Crusade that rolled into our neck of the woods a couple of weeks ago, for a late Sunday afternoon Miracles In Los Angeles tour stop. Unusual “gifts” come in the mail from Robert Tilton. Michelle has received things like “seed money” that she was supposed to send back to Tilton with a bunch of her own money. And a prayer poster that decorated our refrigerator for a couple years is adorned with a squinting Robert Tilton (clearly deep in prayer) with his hand up, palm out, as “Our Miracle Point of Contact” that she was supposed to touch for 21 days after pasting 21 prayer stickers onto the poster, all the while sending weekly confirmations back in pre-addressed envelopes that she is still “Standing For [her] Miracle” along with, you know, money. The payoff comes at the end when he prays over your stuff and affirms your miracle and your place with God. It’s actually even more complicated than that, but there you go. Stuff like that makes Michelle very happy. It’s all just so much hokey hocus-pocus fun if you don’t actually believe. Michelle has never sent Tilton a dime. Obviously, many people do the magic touching of the hand on the fridge and other such nonsense along with, and more importantly, the sending of their money part of the deal or Tilton wouldn’t keep sending out these kinds of things for Michelle to play with. Anyhow, the Come & Receive your Miracle postcard came and Michelle was excited (fixin’ to have a come apart, as Michelle would say) at the prospect of seeing this Apostolic Pastor in full Pentecostal fervor doing his thing live for near gaga followers who perhaps dragged along some of their friends in need of The Word and a good, old-fashioned, zapped-by-the-Lord-and-hit-the-floor-board healing. Michelle didn’t have to talk me into going. Beneath my skepticism there lives the curiosity of an anthropologist. Michelle is much more acquainted with that culture and would act as my expedition guide. As it turned out we had lots of errands to run on the same day as the Tilton show. It wasn’t so easy to clear the deck because the postcard had only arrived on Friday, which gave us two weekend days to do whatever we had to do on those days to prepare for Thanksgiving. And the Tilton thing was on Sunday. It didn’t occur to us that the invitation was on the late side, as invitations go. I was a little worried about time. Michelle suggested that if it was very crowded we should just hang for a while, take it in and leave early. She also pointed out that the “healings” that come at the end could take awhile, and there was no reason to stay after more than a few of those if we still had other things that needed to get done. When I turned in to the parking lot at the Courtyard by Marriott hotel where the event was to take place, the first thing we noticed was an almost empty parking lot. Odd. We were running a bit on the late side, and I was happy to see that most of the people didn’t want to pay for parking, which meant that we could park closer than I thought would be the case. That’s how I sized it up, anyhow. Still, as we approached the door to the hotel lobby we saw only a few people milling around. Did we get the day wrong? We walked through the lobby to the hotel desk and asked about the Tilton event. The desk clerk directed us to take the elevator to the second floor. Understand, I was there to observe. So was Michelle. (We agreed in advance to adhere to the Prime Directive.) Our plan was to sit in the back and just kind of blend. Be part of the crowd. Sitting in the back would work best especially if we were to leave early. No muss, no fuss. We stepped out of the elevator and walked in the direction that the desk clerk had advised. At the end of the hall were two large open doors and through them we could only see a few people, and mainly they were very well coiffed and perfectly pressed and manicured people looking hopefully out from inside the room, right at us. Uh-oh. Cheerful and smiling, they waved at us. They were waving us in. Michelle and I exchanged glances and didn’t have to speak to know what the other was thinking. I have been to church with friends. I have been to the synagogue on many occasions. I have been to New Age expos and psychic fairs. But this was the first time I actually felt aware of my lack of belief as though it were some kind of giant disfiguring boil on my face impossible to not notice and impossible to look away from. We smiled back at them and walked in. The room was set up with several rows of chairs, about ten rows deep in a semicircle with three aisles for easy seating. Up front and in the middle there was a slightly raised stage with a podium. To the left of the stage was a keyboard and some sound equipment and on either side of the stage were raised speakers. We took our seats at the rear of the theater, close to the doors, in accordance with our plan. In front of us were rows of only empty seats on our side of the aisle. I don’t know how we could have been any more conspicuous. Blending was out of the question because there was no crowd to blend with. At that point it was just the Tilton entourage, a couple sitting in the front row on the other side of the aisle, a mom and daughter sitting a couple rows back and us. And by golly, they were all happy to see us. “So, when did you get the invitation?” she asked. “Yes, but there may be more by now,” I offered, trying to be helpful. “No.” I knew what he was getting at. Silly me and not really certain about how these things worked I asked him if they were going to cancel? “I’ve brought the Word to one person and I have preached to thousands. Millions on TV. It doesn’t matter how many people are here. The Lord is in this house and I’m ready to preach! Praise-the-Lord!” He nodded with a knowing kind of smile that made me wonder if he had noticed the boil on my face. He then turned away to greet some new arrivals. Up front was a pretty blond woman in a black pant suit who kept turning around. She wasn’t smiling. She was glancing back though the open doors, no doubt looking for more people to arrive. Unlike Tilton, she couldn’t hide her concern. Unfortunately for us, we were right in her line of fire. Aunt Bea returned and offered us some mints, which we politely declined. I showed her our cough drops and told her that we were good. Off to the side of the stage, fooling around with the sound equipment was Paulie Walnuts from The Sopranos. Well, he looked like Paulie Walnuts from The Sopranos anyhow. He was the fourth member of the Tilton entourage and seemed to be the busiest, going about getting things ready for the show. He too was a sharp-dressed and perfectly manicured man. God takes care of those whose job it is to spread the Word and appearances do matter. If tithing brings you a three-fold return on your investment, it would not do to look anything but prosperous. I suppose that’s true of most people who sell an expensive commodity. Just take a look at real estate agents, lawyers or investment brokers as possibly the best example. The show was about to begin. There were ten people in the audience now bringing the total to fourteen in the room. Robert Tilton asked for those in the back, mostly us, to move forward to form a more compact group. “Ah crap.” We did it but we weren’t happy about it. We knew we were outsiders and would remain so, no matter how close we got to the other bodies in the room. Leaving, while certainly an option, would have left a significant hole in the congregation, which, due to the now-surreal circumstances of our situation, we were all too aware of. And anyhow, we really did want to see Tilton’s performance. Tilton asked us to get to know the person to the left and right of us. That turned out to be everyone in the congregation, I suppose mostly because there weren’t many of us. We all shook each others’ hands. I had the distinct feeling that we were all supposed to feel like brothers and sisters with the Lord in common among us. Of course, we weren’t and I doubt that He was. With that formality out of the way, Aunt Bea took her place at the keyboard. Paulie stood by the side of the stage. The blond kept looking back and Tilton took his place at the podium. Tilton introduced Aunt Bea and Paulie as old friends, a husband and wife team that has been with him for years. Paulie, in fact, had graduated to become a full-fledged minister in his own right but chose to remain loyal to the Tilton ministries. Tilton also introduced his wife, the blond in the front row, who turned and waved at the thin turnout, this time smiling. Then she resumed looking back at the doors from time to time. We were then asked by Tilton to stand and bow our heads in prayer and praise-the-Lord for bringing us together and so on and so on, for what seemed like an eternity to me, while Aunt Bea plunked out some soft prayer-appropriate music on her keyboard. I looked down. Then I looked up. I looked over at Michelle who was just standing there. I looked at the guy across the aisle from me who was looking down with his eyes closed but with hands outstretched with palms up. I tried that, but as my expedition guide, Michelle elbowed me again. Her expression told me that I looked ridiculous. I gave up for the time being. This worship thing takes some practice. While there is no exact right way to do it, apparently it does not do to look awkward and self-conscious if your intent is to remain incognito, which was obviously going to take much more work than we had previously anticipated. Tilton ended the prayer with an amen and immediately brought up Paulie who would lead us in singing several worship songs. Everyone was still standing. The sound system really came to life when Paulie started singing, with prerecorded full choral backing and tightly scored arrangements played loud. We would be worked up with song! Of course, I had never heard any of those songs before. Some of the congregation sang along. I assume that the songs are standards in the worship song category, which has never been a favorite of mine. A couple of people were really getting into the songs, waving their arms in the air, moving in time with them and singing along. Michelle and I tried to sing along with one chorus of a particular song but couldn’t make out the words. I waved my hand in the air and Michelle jabbed me with her elbow again. (Once, I put both hands up, which earned me another jab. Later, Michelle told me that I looked like I was being arrested at gunpoint.) I was just trying to get into the spirit of the thing, you know? Lance the boil with a diversionary tactic of surgical precision, if I could. But I guess I have two left hands. My ribs were beginning to get sore from being jabbed so often. The next opening act was Tilton’s own beautiful wife who he brought up on stage to sing us another worship song. The less I say about that, the better. Well, the “amen” was rather tepid but hell, there were only ten people in his congregation that day and at least two of them were atheists. Still keeping it in the family, he took the microphone in hand, walked across the stage and gazed lovingly down at his wife. He told us the story of how they met. It happened while he was driving home from a meeting in Miami. He was down at the time. Things weren’t going all too good for him. And he was also beginning to wonder if he would ever find another woman to love and to love him back. And thinking about that while driving, he stopped at a traffic light next to one of the most beautiful woman he had ever seen. An angel. She was talking to her mother on a cell phone, in her car, and didn’t see him. So he rolled down his window and yelled to her. She looked over. He asked for her number so he could call her right then and there. She was hesitant and told her mother what was happening and her mother advised her to get off the phone with her, give him the number and give him a chance. (That’s the usual advice from the mother of a beautiful woman when a strange man, thirty to forty years older than her daughter is making a pass at said daughter in traffic. “Give him your number dear.” Perhaps that was the miracle part. I dunno.) He found the miracle of a loving wife (his third) while driving in Florida traffic. So now, he has a wife again, two kids by her, and a stroller that is miraculously undamaged. Praise-the-Lord. Tilton is a good storyteller. And he told the story of finding his latest wife in traffic with lots of conviction and really did incorporate it into a bigger story about personal miracles leading to prosperity. Miracles that happen if you have faith in the Lord. I couldn’t read how the other people there took it, but I thought the story was more than a little bit creepy. Clearly he had amused himself with that last thing and he laughed. He laughed a little too hard for a little too long. And that segued into a talk about office supplies, or more precisely, the miracles that the Tilton coven has experienced while setting up and working out of his new office and headquarters. For example, he was quoted forty thousand dollars for a fiber-optic line to be brought into his office from the utility company. “Forty thousand dollars. Where were we going to get that kind of money?” Then someone down the street got the line and the utility company called to tell him that he could now have it for free. A miracle! Anecdotes like these flowed from him, to the few people there, and they seem to be taking it in as though through him God was telling them what they needed to know. As though a profound message could be gleaned from what he told us about his printing machine. The moves were all there. His voice would rise to a shout and lower to almost a whisper. Now and then I heard an “amen” from one of the folks sitting around us. But here’s the thing: he wasn’t there to be profound. He was there to make a connection with the people in that room. He was there to tell them their stories by telling them his. And even if his stories are mostly made up, it doesn’t matter as long as he makes that connection. His sermon is a medicine show and his snake oil is hope. It’s a niche market that someone, if not Tilton, or others that we have come to know, will step in and fill. Has it not always been thus? He tells the people what they want to hear as long as they are willing to pay for it. We may think of him as a scoundrel, but that’s only one side of the equation. On the other side are his followers who are more than happy to respond to someone who is speaking directly to their concerns. Can I get an amen? Tilton asked the woman what she needed from the Lord and she whispered to him. He whispered back and then put one arm around her back and put his other hand on her forehead. And he began to pray out loud for the Lord to hear the prayers of this woman. He looked up and raised his voice and called for the Lord to heal this woman and then he looked back at her. He asked us to raise our hands and pray. Aunt Bea was playing the prayer music again and Paulie moved in and stood behind the woman. Tilton raised his voice, louder and louder and then suddenly as though he himself could not control his own words he looked out toward the congregation, his eyes squinted and he began babbling in tongues. He moved into and out of tongues so smoothly that it almost seemed like it didn’t really happen. Like my ears had deceived me for a few seconds. They hadn’t. As the woman lay there, Tilton moved off the stage to a woman who he had apparently had some contact with before. He knew her. He had called her on the phone personally (which may be why she was there, because the invitations went out late). After making a big deal about how surprised this woman was to receive a personal phone call from Robert Tilton himself, who she had met before in New York, he put his arm around her and his hand on her forehead and began to pray again. Paulie moved in behind her as Tilton worked his way through pretty much the same routine as he had for the woman who had landed on the floor at the stage but who was now back in her seat after some assistance by Paulie. The second woman didn’t drop. Aunt Bea kept on playing. After a bit more from Tilton, we were all asked to come up to the stage and directed to take each others’ hands. And with another little prayer it was over. And then there began a lot of hand-shaking and hugging. People were still talking and hugging but we weren’t really up for that. What would we have talked about? We waited. Tilton finally returned to us and Michelle moved in beside him. “Where’s your camera?” he asked. I held up the Blackberry and said something about these modern times that we live in. He nodded. I took the picture and showed it to them both. He shook our hands and as we turned to leave I suggested to him that he should get his mailing out earlier next time. I don’t know why but that comment seemed to take him by surprise. “Ahhh, I guess so” he mumbled. It became an awkward moment. Perhaps I wasn’t showing the proper amount of awe after being at one of his performances? I dunno. I put the validation on our parking stub and gave it to the attendant when we arrived at his little booth. He took it, rang it up and told me that we still owe six dollars. “Really?” I laughed and got my wallet out.